Preppy Pink Crocodile: Where Did Lilly Go? I'm glad someone else feels the same way! These are cute but they are too trendy for Lilly, which is supposed to be timeless!! Also none of these designs scream fall or winter to me, and I am not in the mood to shop for spring or summer yet. I am loving that last dress! Actually, I wouldn't consider these trendy. 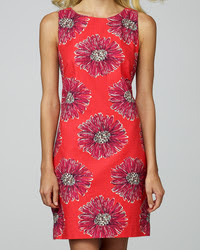 Yes they are not the typical print and cut of a Lilly dress, but they do have classic timeless elements to them. The cut of the first two are reminiscent of the dresses often seen in the 60's,think Samantha in Bewitched. The sheath cut of the last one never goes out of style. I may be one of the few who likes these, particularly the first one. I really have only purchased the shirtdresses lately. I have still not seen the fall line in person yet. I must check it out soon though and see what I think! 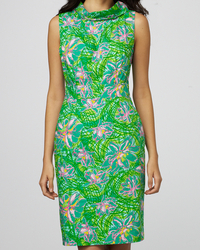 I love Lilly P but it is changing, don't know if I like that. I'm a new follower from Fabulous Friday follow, I would love if you would follow me back. I completely agree with you that everyone has their own taste and opinions on anything and everything. Like we can all LOVE Lilly, but don't have to love every single piece of Lilly that comes out. I mean I'm a big fan of the styles out right now, but I don't necessarily like the Resort that just came out. I think you're entitled to your opinion, it is your blog after all, right? I agree with you. I wish they would stick with the shifts and the more classic lines. : ) <3 your blog by the way. Take a peek at my giveaways if you stop by. Everything is handmade and GORGEOUS!